Designed for a wide variety of applications. 2¾" (70mm) deep ledge contains product and spills. Strong: each shelf can hold up to 150 lbs. 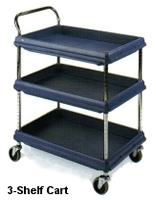 (68kg); each unit can hold up to 400 lbs. (180kg). Cleanable, smooth surfaces are designed to resist staining and wipe clean easily. Easy to position center shelf option adjusts on 1" (25mm) increments. Aesthetic design allows for use in a variety of applications. 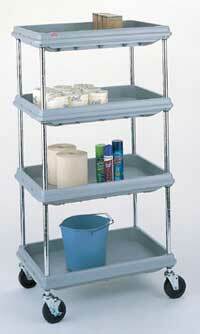 Available in 20" x 30" (508 x 762mm) and 26" x 36" (660 x 914mm), 2- and 3-shelf models. Easy no-tool assembly. Shipped knocked down. Available in four colors: Gray, blue, berry and black. Versatile to function in front-of-house and back-of-house areas. 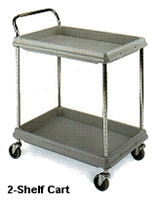 Aesthetic neutral gray shelves and 5" casters provide a very flexible display opportunity, especially in floral and produce areas of the store where product and moisture need to be controlled.